This BRIEFing NOTE is about multi-age grouping (also called mixed-age or family groupings) in early childhood programs. It is written to inform the dialogue about a proposal by the Ontario government to introduce regulations for multi-age grouping models in the province. It provides details and context for the proposals, briefly reviews pertinent research literature on multi-age grouping and examines how multi-age settings are regulated in other jurisdictions. 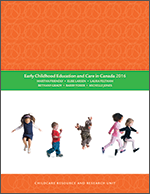 The importance of ratios, group sizes and ECE training in multi-age grouping is explored.